The distribution system is the most equipment and maintenance intensive portion of the bulk power system. The design of the distribution system is not a true “grid”; with multiple power delivery paths for a single load. 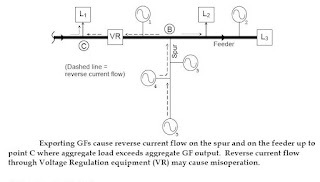 Instead, each load is usually clearly paired with a generation source, typically a substation delivery point. A centralized grid can be inefficient and costly. Only a third of the fuel energy burnt in power plants ends up as electricity, with half lost as waste heat, and a further 8% lost along long-distance transmission lines. The grid is often congested because it relies on a few high-traffic arteries. The congestion amplifies the inefficiency because if the utility cannot redirect power from efficient sources, they have to turn to costlier, dirtier and more inefficient sources to meet peak demand. A more distributed grid, by its very architecture, can improve efficiency by matching local supply with demand. With multiple decentralized energy sources, electricity can be generated close to the point of use, avoiding the losses and congestion that result from long-distance transmission. Some of the most efficient energy sources are small turbines powered by natural gas, or biogas, which use waste heat to provide heat and hot water to the local area, and convert energy with 70–85% efficiency. 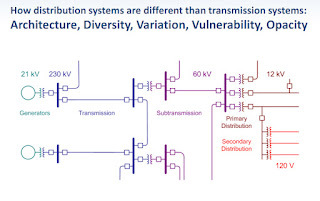 In a paradigm shift, the distinction between transmission and distribution blurs when energy flow becomes bidirectional. For example, distribution grids in rural areas might generate more energy than they use turning the local smart grid into a virtual power plant, or a city's fleet of one million vehicles could be used to trim peaks in transmission supply by integrating them to the smart grid using vehicle to grid technology. Today's Hierarchical Power System compared to a fully networked Smart Grid illustrating the shift from a one-to-many paradigm to a many-to-many arrangement. In the first, we see today’s hierarchical power system, which looks much like an organizational chart with the large generator at the top and consumers at the bottom. The second diagram shows a network structure characteristic of a fully implemented smart grid. DA - Distribution Automation - The extension of intelligent control over electrical power grid functions to the distribution level and beyond. 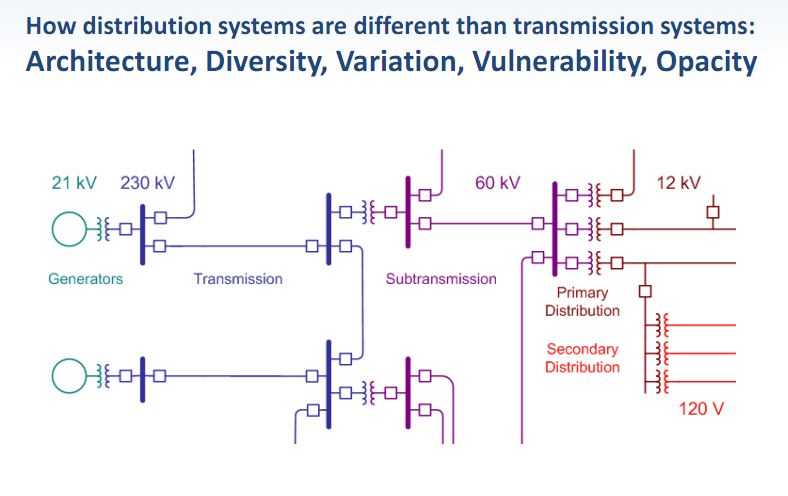 Normally, electric utilities with SCADA systems have extensive control over transmission-level equipment, and increasing control over distribution-level equipment via distribution automation. However, they often are unable to control smaller entities such as Distributed energy resources, buildings, and homes. DER - Distributed Energy Resource - (also called DG – Distributed Generation, on-site generation, dispersed generation, embedded generation, decentralized generation, decentralized energy or distributed energy) Physical, capital assets on the distribution network that generate, store, or consume electric power. Among these are demand response, distributed generation, and electricity storage. Systems are small-scale power generation technologies (typically in the range of 3 kW to 10,000 kW) used to provide an alternative to or an enhancement of the traditional electric power system. DER’s are not broadly deployed as grid assets at present. Includes solar, micro-wind, micro-hydro, fuel cells, and combined heat and power. This generation can help to support local power grids in the presence of blackouts, and ease the load on long-distance transmission lines, but it can also destabilize the grid if not managed correctly". Usually, utility control centers are unable to manage distributed generators directly, and this may be a valuable capability in the future. IEC 61850 - a standard for the design of electrical substation automation. The abstract data models defined in IEC 61850 can be mapped to a number of protocols. Current mappings in the standard are to MMS (Manufacturing Message Specification), GOOSE, SMV, and soon to Web Services. These protocols can run over TCP/IP networks and/or substation LANs using high speed switched Ethernet to obtain the necessary response times of < 4 ms for protective relaying. Recloser - a circuit breaker equipped with a mechanism that can automatically close the breaker after it has been opened due to a fault. Autoreclosers are used in coordinated protection schemes for overhead line power distribution circuits. These circuits are prone to transitory faults such as nearby lightning strikes, wind-borne debris,and animals climbing the insulators. With a conventional circuit breaker, a transient fault would open the breaker, disabling the line until a technician could manually close the circuit breaker or replace the blown fuse. But an autorecloser will make several pre-programmed attempts to reenergize the line. If the transient fault has cleared, the autorecloser's circuit breaker will remain closed and normal operation of the power line will resume. If the fault is permanent (downed wires, tree branches lying on the wires, etc.) the autorecloser will exhaust its pre-programmed attempts to re-energize the line and remain tripped off until manually commanded to try again. About 90% of faults on overhead power lines are transient and can be cured by autoreclosing. Relay – An electrically operated switch. Relays are used where it is necessary to control a circuit by a low-power signal (with complete electrical isolation between control and controlled circuits), or where several circuits must be controlled by one signal. Relays controls the opening and subsequent reclosing of circuit breakers. Relays take measurements from local current and voltage transformers and from communication channels connected to the remove end of the lines. Substation - Transform voltage from high to low, or the reverse, or perform any of several other important functions. Electric power may flow through several substations between generating plant and consumer, and its voltage may change in several steps. The word substation comes from the days before the distribution system became a grid. The first substations were connected to only one power station, where the generators were housed, and were subsidiaries of that power station. Switchgear - The combination of electrical disconnects, fuses and/or circuit breakers used to isolate electrical equipment. Switchgear is used both to de-energize equipment to allow work to be done and to clear faults downstream. Transformer – A device that is used to change one value of voltage and current to another value of voltage and current (e.g. 12kV to 120/240 volts) A substation that has a step-up transformer increases the voltage while decreasing the current, while a step-down transformer decreases the voltage while increasing the current for domestic and commercial distribution. With the growth of dynamic generation sources, the needs of the distribution system will need to be dynamically managed. Dynamically controlling a complex distribution system will require new smart grid tools and systems. According to a Navigant research report, a smart distribution network will simplify interconnection of PV and improve its economics, increasing the projected installed capacity by over 60% by 2020. Modeling - Utilities don’t know what level of PV penetration will create problems in the distribution network. PG&E currently has more than 30,000 solar customers with 300 MW and so far there have been overloads and high voltage situations in subdivisions and groups of homes with a high penetration of PV. Transformers for solar subdivisions need to be rated higher than if there was simply distribution load there. This will increase cost without smart grid technology to manage flows. Voltage Regulation - Inverters we have today on individual PV systems are not designed to regulate overall voltage. They don’t necessarily think about how to operate the grid. When everyone’s PV’s are on we see high voltage. Coordinated control of PV inverters will help optimize the grid. 1. Protection when power line comes down. Distributed Generation is currently a parallel universe. EEI - Electricity Distribution - The nation's electric distribution systems deliver power along millions of miles of lines to neighborhoods, businesses, and consumers.